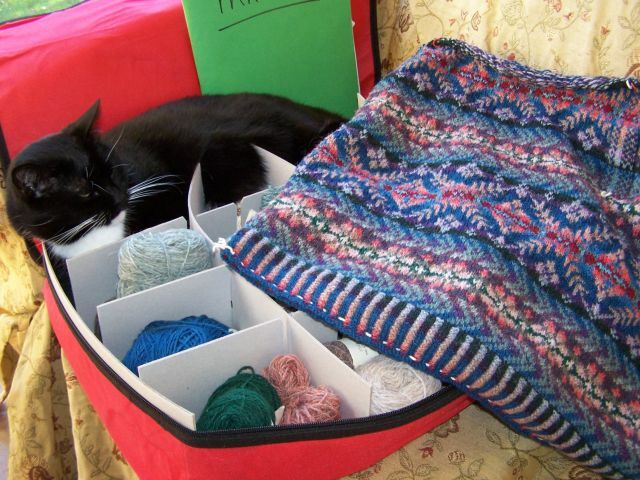 Boots, the cat, and the ornament/yarn box - I found this really nice fabric box at the local "Christmas Tree Shops". For a change, the store actually had Christmas items in it plus a ton of Halloween stuff. This box is lightweight red fabric with a zipper and cardboard inserts to mark off little bins to put ornaments in. Can you say perfect box for Fair Isle knitting and putting all those balls in their own little bin? Pretty nice idea for $1.99. Got two of course. Much easier to find then rooting through a big bag at each color change. Guess who found the box and managed to stuff herself into the corner. Why Miss Boots of course!! She is becoming much more of a people cat now that she is the only one in the house. I really miss Patter but he was the alpha cat and she lived in his shadow. Now she is making her presence - and voice heard. Marina is up to five rows before the back neck steek. I'd like to get the sweater to the shoulder bind off this weekend and then work on "Beadwork" for a while. It feels so odd to be one hand knitting with one color on Beadwork and with a slightly thicker yarn. 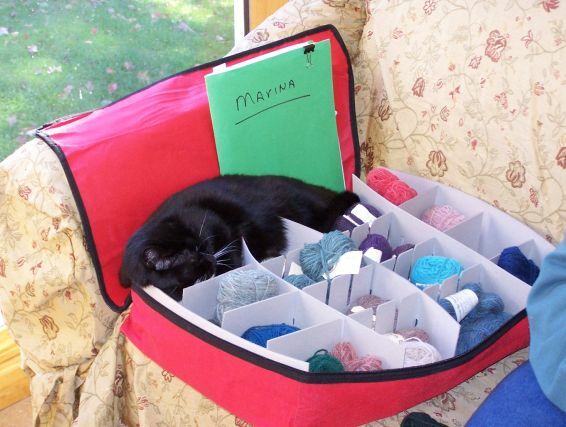 Cannot imagine what it would feel like with regular weight knitting worsted! The perennial gardens are all cleaned up and mostly mulched for the winter. Flock of wild turkeys roamed through today, really pretty with the bright fall leaves behind them. It's beginning to get colder but no snow yet. 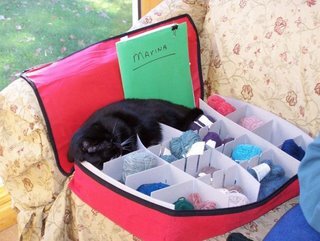 What a super idea - an zippable ornament box - for keeping your skeins in! I love both your Marina and Mara sweaters. Would you mind sharing what kind of needles you use and their sizes? I'm a novice Fair Isle knitter drooling over the lovely AS sweaters! What a motivation your pictures are for me.